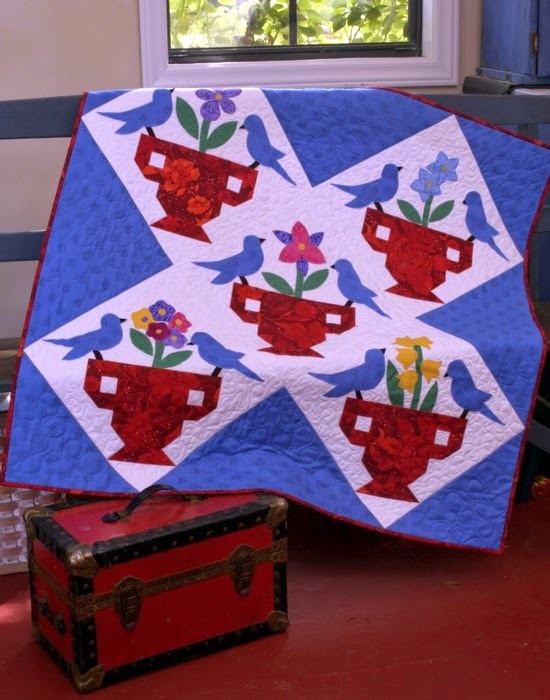 I have another Love Birds quilt that I wanted to share with you. 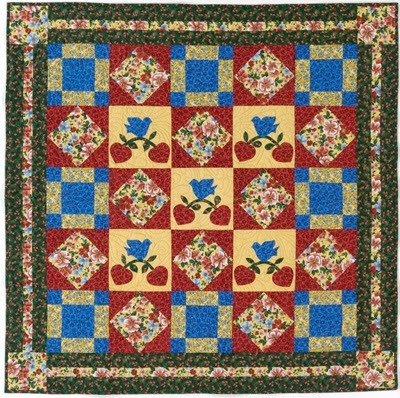 I made this using a fabulous collection of reds, blues and yellows from Kona Bay Fabrics. Yes, that simple bird applique is back and this time perched on a branch with a heart on each end. 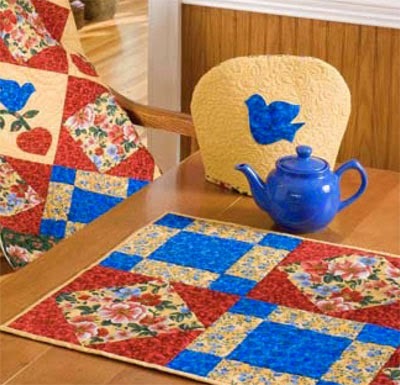 Very folk art-y! Did I share with you my Tea Cozy Ensemble using this same bird? I have since gifted this ensemble to a family friend and I know she absolutely loves it. I sure enjoyed making it! Now let's visit our Tree Bird bloggers today and see what wonderful things they have come up with featuring birds on a branch. Please come back one more time on Monday to see my own creations, won't you? 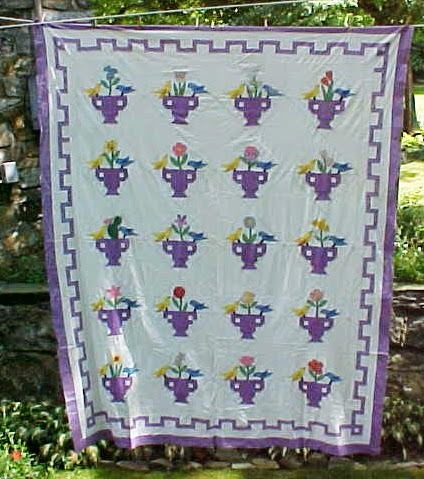 The Garden Bouquet series of blocks ran in the Chicago Tribune in the 1930s under the pen name of Nancy Page (for Florence LaGanke). Each new block came with a whole lot of chatty information, as though you were in the midst of a group of socialites at a tea party making small talk. Each of the 20 blocks features a different flower in a red urn with two birds perched atop: Saucy Bird and Meek Bird. While they weren't doing all the chatting in these weekly pattern reveals, the women in this imaginary tea party certainly were! I absolutely love these historic pattern sets. I redrafted the blocks (not scans) and typed all the words that came with the pattern. I've included a FREE pdf of the DAFFODIL pattern here so you can see what I mean about all those chatty words. “My heart with rapture thrills and dances with the daffodils,” thus quoted Nancy Page and thus echoed the club members. Now, let's see what our Tree Bird bloggers are up to today!